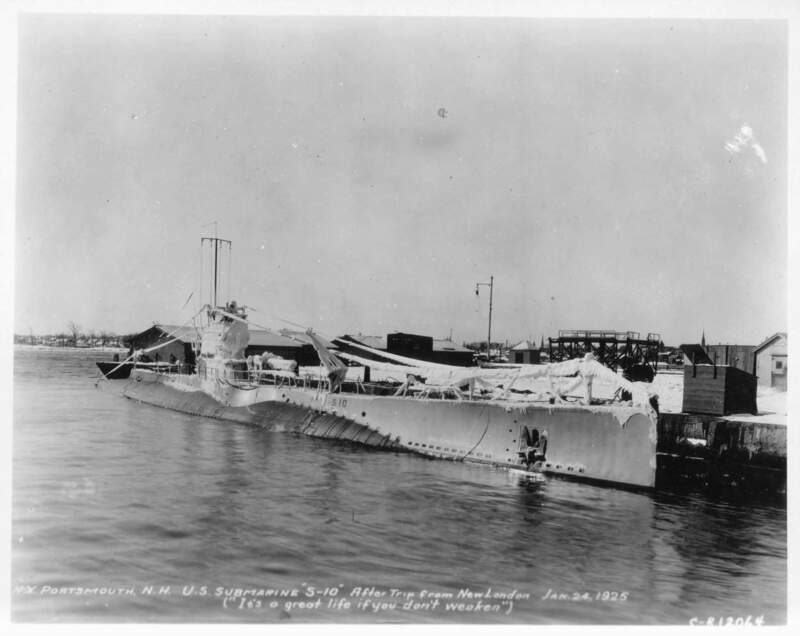 S-4 Class Submarine (Government-type): Laid down, 11 September 1919, at Portsmouth Navy Yard, Portsmouth, N.H.; Launched, 9 December 1920; Commissioned, USS S-10 (SS-115), 21 September 1922; Decommissioned, and struck from the Naval Register, 17 July 1936, at Philadelphia Navy Yard, Philadelphia, PA.; Final Disposition, sold for scrapping, 13 November 1936. 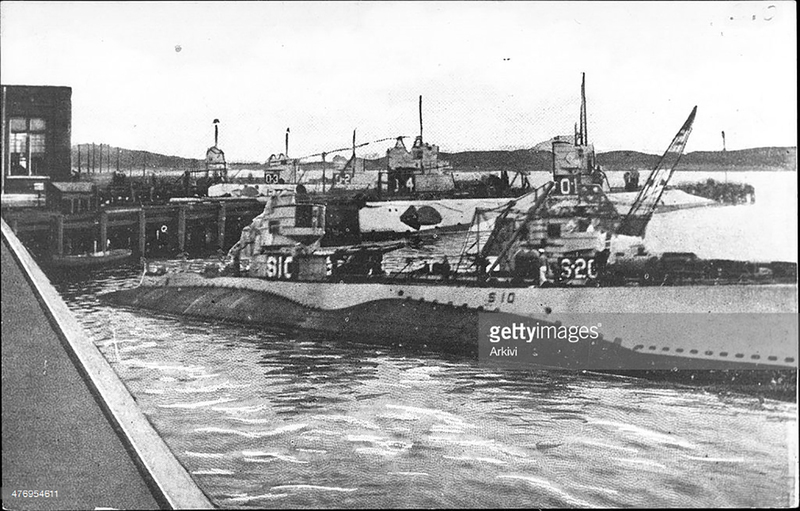 Specifications: Displacement, Surfaced: 876 t., Submerged: 1092 t.; Length 231'; Beam 21' 10"; Draft 13' 1"; Speed, surfaced 15 kts, submerged 11 kts; Depth Limit 200'; Complement 4 Officers, 34 Enlisted; Armament, five 21" torpedo tubes, 14 torpedoes, one 4"/50 deck gun; Propulsion, diesel electric engines, Maschinfabrik - Augsburg - Nurnburg, New York Navy Yard diesel engines, 2,000 hp, Fuel Capacity, 36,950 gal. ; Westinghouse Electric Co., electric motors, 1,200 hp, Battery Cells, 120, twin propellers. 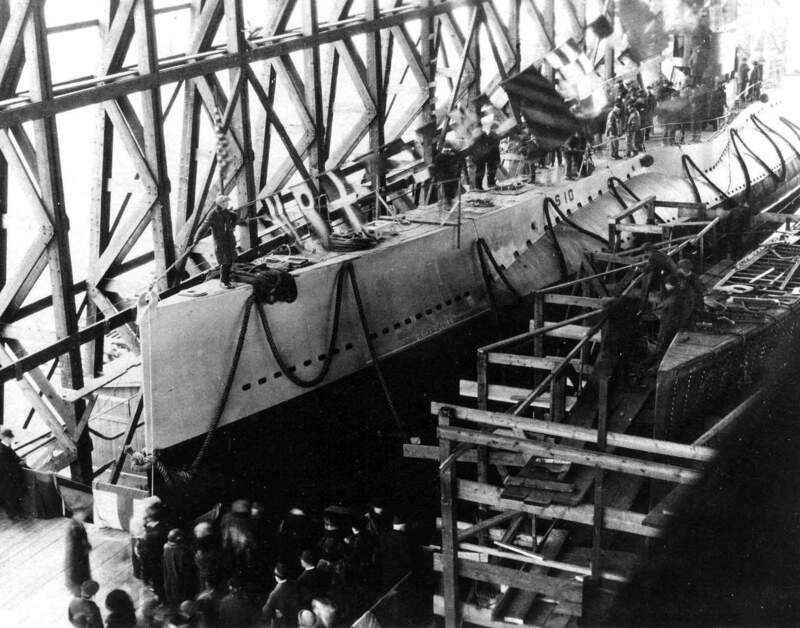 2.21k Miss Marian K. Paine, Sponsor, christens S-10 (SS-115) during the submarine's launching ceremonies, at the Portsmouth Navy Yard, Kittery, Maine, 9 December 1920. The original print was received from the Office of Naval Intelligence in 1936. USN photo # NH 41774, courtesy of the National Museum of the U.S. Navy, via flickr.com. 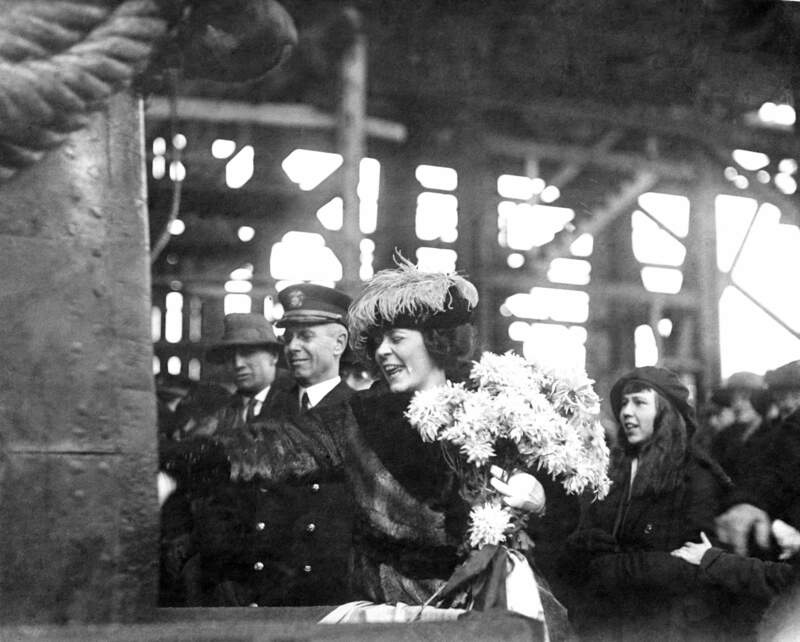 67k Miss Marian K. Paine, Sponsor, poses by S-10's (SS-115) bow with her bouquet and the christening bottle, during the submarine's launching ceremonies at the Portsmouth Navy Yard, Kittery, Maine, 9 December 1920. Also present is Captain Laurence S. Adams, USN (Construction Corps), the Navy Yard's Industrial Manager. The original print was received from the Office of Naval Intelligence in 1936. USN photo # NH 41776, from the U.S. Naval Historical Center. 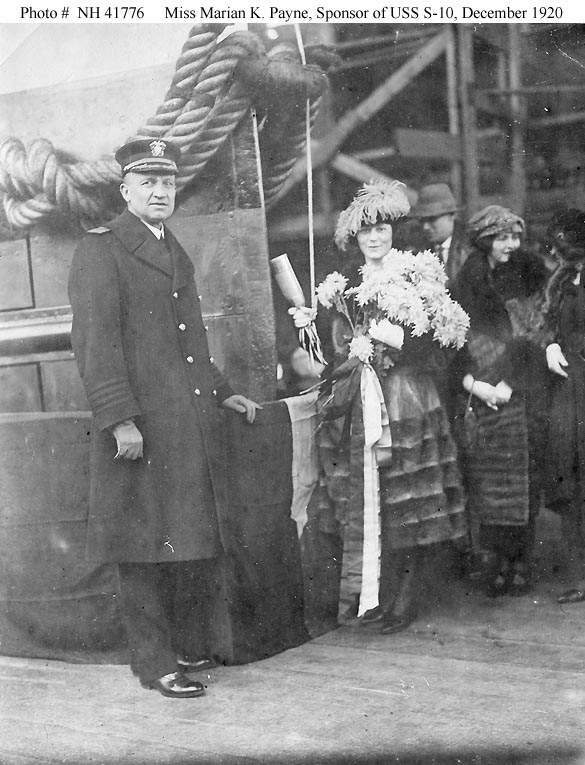 832k Miss Marian K. Paine (holding bouquet and christening bottle), the submarine's Sponsor, poses with members of her party and other dignitaries during S-10's (SS-115) launching ceremonies at the Portsmouth Navy Yard, Kittery, Maine, 9 December 1920. 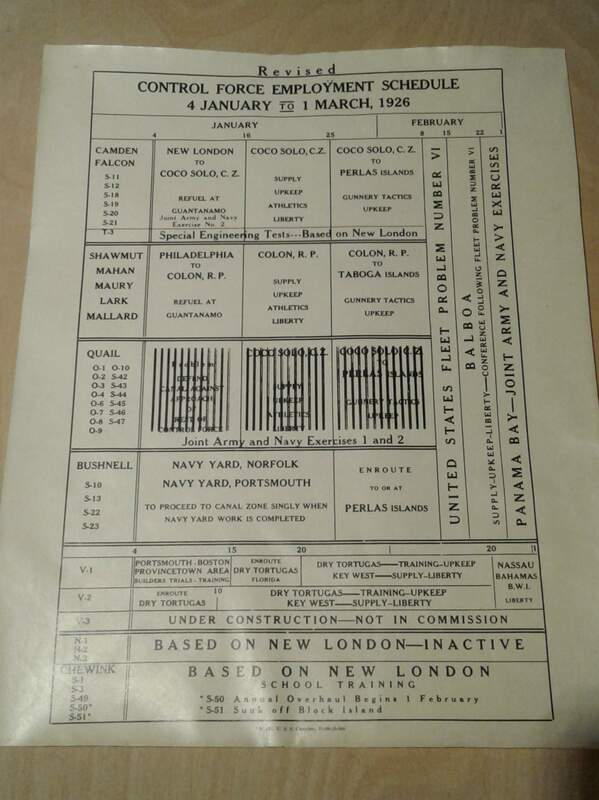 Notes on the original print identify those present as (from left to right): Scaritt; Wales; Adams; Captain Louis R. de Steiguer (Commandant of the Portsmouth Navy Yard), Miss Paine, Governor Bartlett, and Captain Laurence S. Adams (Portsmouth Navy Yard Industrial Manager). USN photo # NH 103619, from the U.S. Naval Historical Center. Collection of Rear Admiral Bradford Bartlett, USN. 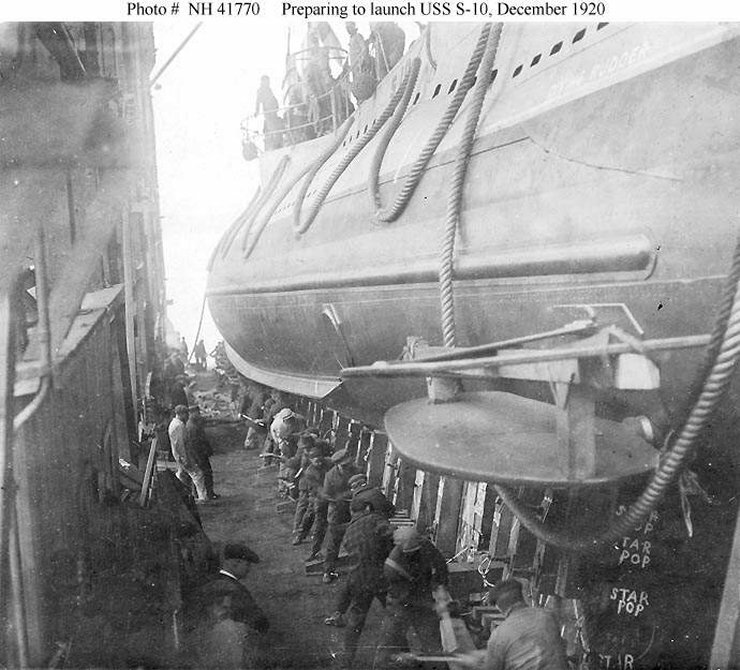 62k Workmen knocking out wedges between the S-10 (SS-115) and her building ways, while preparing for her launching at the Portsmouth Navy Yard, Kittery, Maine, 9 December 1920. The original print was received from the Office of Naval Intelligence in 1936. USN photo # NH 41770, from the U.S. Naval Historical Center. 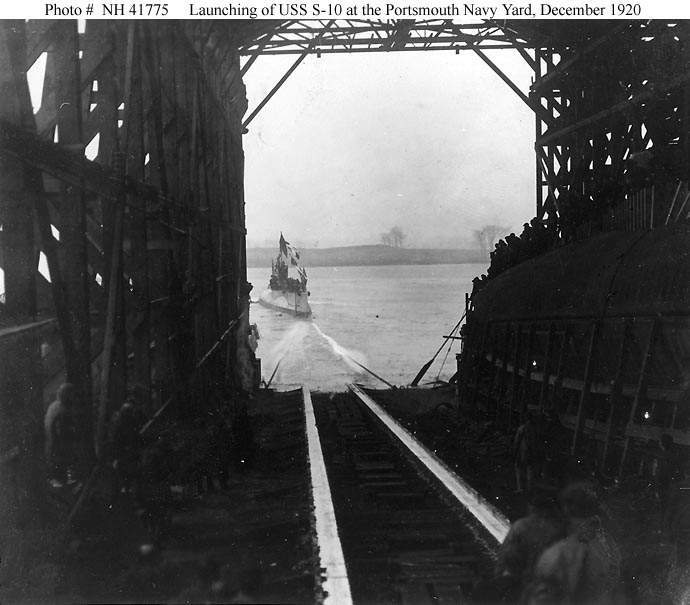 210k Launching of the S-10 (SS-115) at Portsmouth Navy Yard, Portsmouth, N.H., 9 December 1920. Note the partially built bow of the S-11 (SS-116) to her right. USN photo courtesy of ussubvetsofwwii.org. 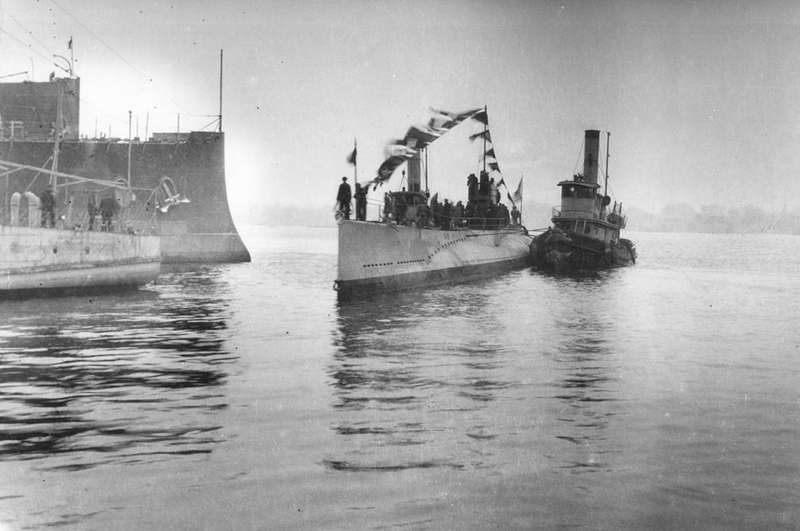 511k S-10 (SS-115) being moved by tug to a berth, following her launching at the Portsmouth Navy Yard, Kittery, Maine, 9 December 1920. The original print was received from the Office of Naval Intelligence in 1936. USN photo courtesy of Scott Koen & ussnewyork.com. 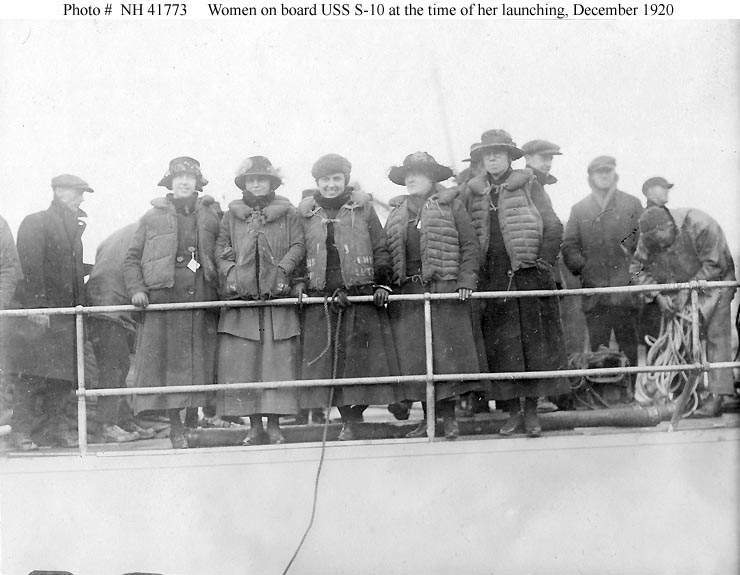 50k Five women on the S-10's (SS-115) deck, at the time of her launching at the Portsmouth Navy Yard, Kittery, Maine, 9 December 1920. These ladies, all wearing life jackets, probably rode S-10 during her slide down the shipways into the water. They may have been Navy Yard employees, as one (at left) is wearing what appears to be an identification tag. The original print was received from the Office of Naval Intelligence in 1936. USN photo # NH 41773, from the U.S. Naval Historical Center. 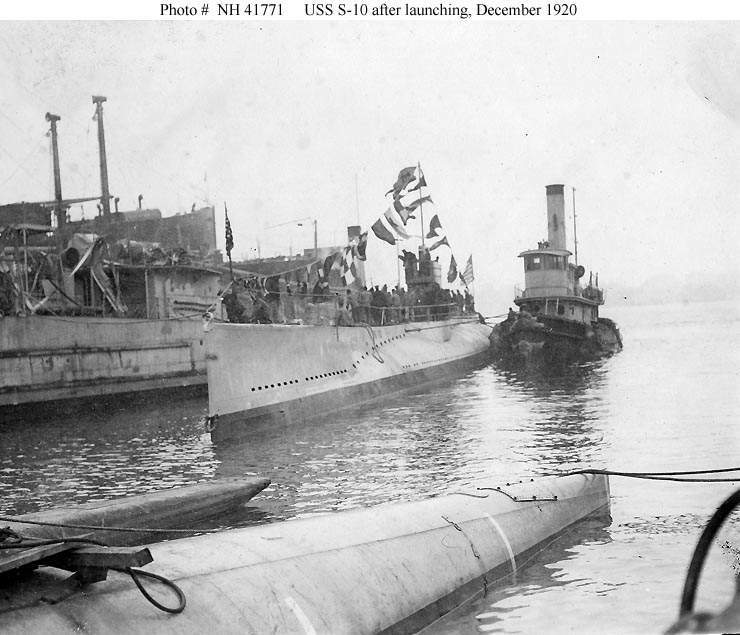 49k S-10 (SS-115) afloat, immediately after her launching at the Portsmouth Navy Yard, Kittery, Maine, 9 December 1920. The original print was received from the Office of Naval Intelligence in 1936. USN photo # NH 41775, from the U.S. Naval Historical Center. 64k S-10 (SS-115) being tugged to an outfitting wharf, following her launching at the Portsmouth Navy Yard, Kittery, Maine, 9 December 1920. The original print was received from the Office of Naval Intelligence in 1936. USN photo # NH 41771, from the U.S. Naval Historical Center. 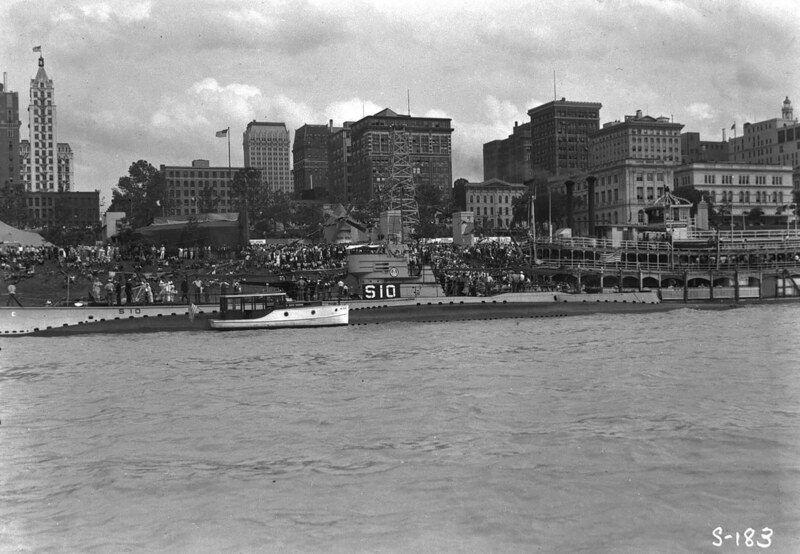 56k S-13 (SS-118), shown about 1941, was one of four government S-boats; S-10 & 13 (SS-15 & 18), redesigned by Portsmouth Navy Yard to carry a torpedo tube aft. Structural detail has been included in this drawing to suggest the complexity of the C & R design, which made it extremely difficult to maintain. The V-1-class (SS-163-65) had similar complex structures. Drawing & Text courtesy of U.S. Submarines Through 1945, An Illustrated Design History by Norman Friedman. Naval Institute Press. 374k Raised bow view, port side of the S-2 (SS-106) at her dock trials at the Navy Yard, Portsmouth New Hampshire, 4 June 1921. The S-10 (SS-115) is pictured inboard. Further inboard is the armored cruiser Huntington (CA-5). She had been decommissioned on 1 September 1920. USN photo # 19-N-7607, from the National Archives and Records Administration (NARA), courtesy of Daniel Dunham. Photo i.d. courtesy of Tom Bateman. 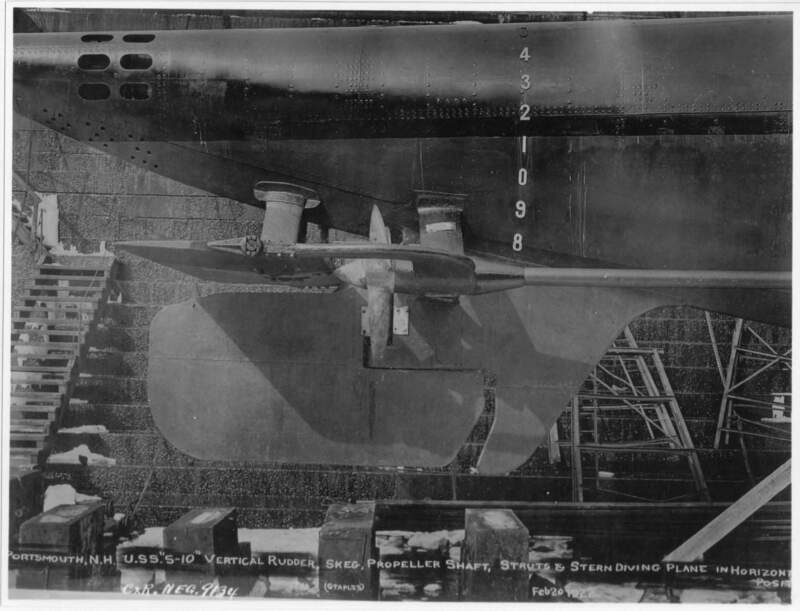 487k S-10 (SS-115) showing her vertical rudder, skeg propeller shaft, struts and stern diving plane in position at the Navy Yard, Portsmouth New Hampshire, 20 February 1922. USN photo # 19-N-9134, from the National Archives and Records Administration (NARA), courtesy of Daniel Dunham. 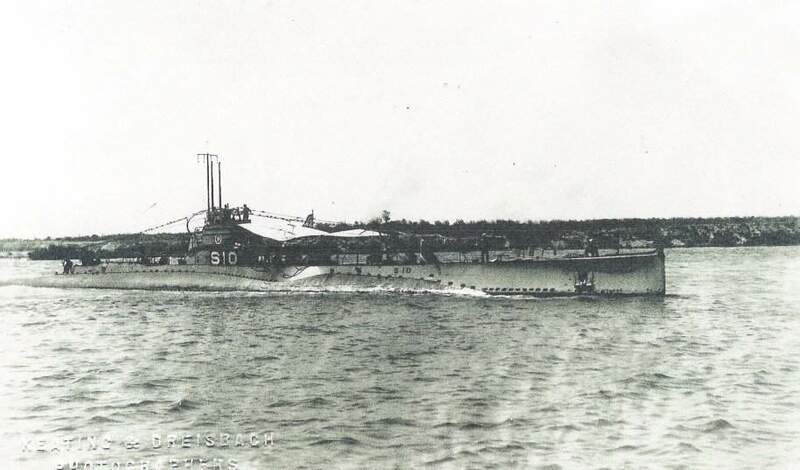 57k The S-10 (SS-115) taken in 1922, possibly before her commissioning. The trees look like they are tropical and the crew seems to be dressed in moderate clothing. There was a period of almost two years between her launching and commissioning. USNI / USN photo. 55k S-10 (SS-115) sailing down the Thames River at New London, CT., 1924. USN photo from the Frederick Wood Collection, courtesy of Stan Svec. 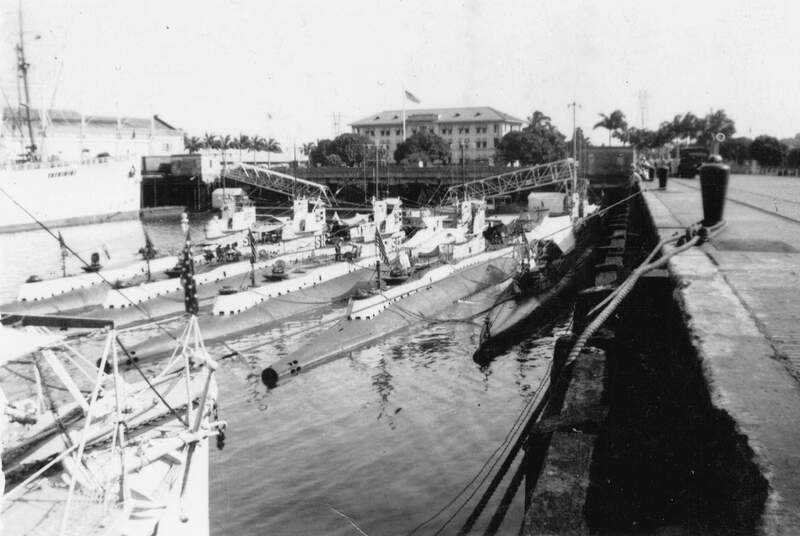 71k Bushnell (AS-5) tending submarines at Gonaives, Haiti, 1924. 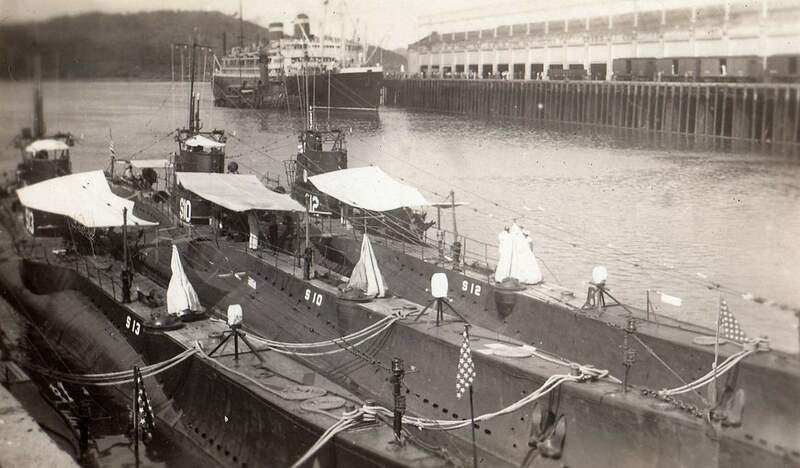 The two outboard submarines are S-10 (SS-115) and S-13 (SS-118). OfficialUSN photo # NH 74633, from the collections of the Naval Historical Center. Donation of Lieutenant Gustave Freret, USN (Retired), 1971. 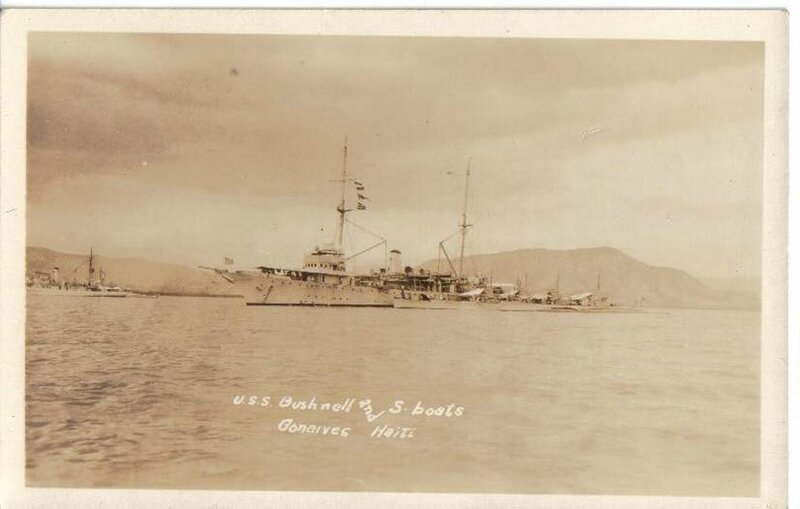 61k Bushnell (AS-5) at Gonaives, Haiti, circa 1924 tending her charges: S-11 (SS-116), S-12 (SS-117), S-10 (SS-115) & and S-13 (SS-118). USN photo courtesy of Robert M. Cieri. 326k S-10 (SS-115) after trip from New London, at the Navy Yard, Portsmouth, New Hampshire, 24 January 1925. USN photo # 19-N-12064, from the National Archives and Records Administration (NARA), courtesy of Daniel Dunham. 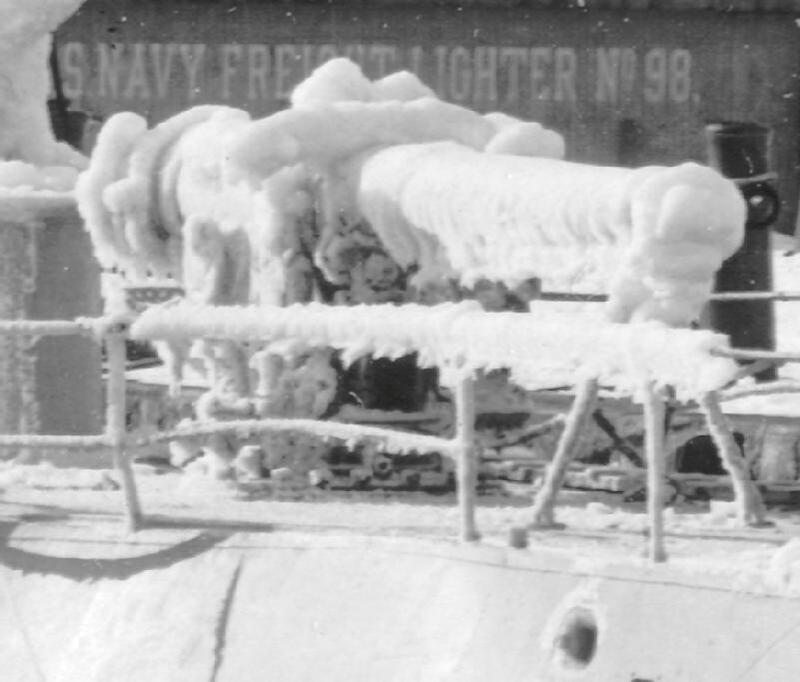 50k Closeup of the S-10 (SS-115) snow encrusted deck gun and freight Lighter # 98 at the Navy Yard, Portsmouth, New Hampshire, 24 January 1925. USN photo # 19-N-12064, from the National Archives and Records Administration (NARA), courtesy of Daniel Dunham & Ric Hedman. 86k S-10 (SS-115) departing the Panama Canal Zone for a cruise up the Mississippi River, 28 April 1933. She wears the Submarine Division Five emblem (the numeral "5" flanked by two seahorses) on her fairwater, directly above the "0" in S-10. Official USN photo # 80-G-455861, now in the collections of the National Archives courtesy of Robert Hurst. 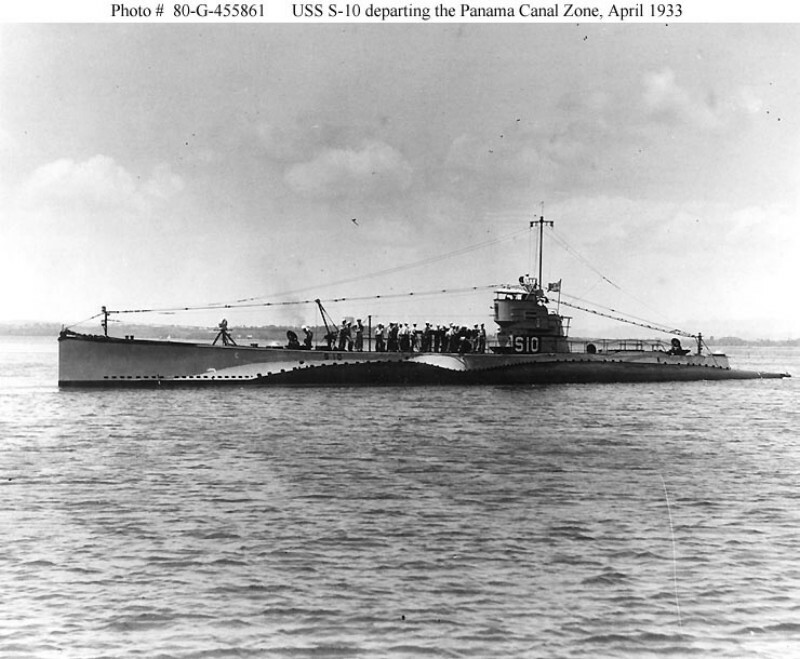 335k From 1929 into 1936, S-10 (SS-115) served almost exclusively in the Panama Canal area although she visited Memphis, Tenn., from 11 to 15 May 1933, and was in reserve, with a partial crew, at Coco Solo from 1 July to 27 November that year. She appears here docked by the levee at Memphis, Tennessee in the foreground, the city of Memphis in the background and a large crowd on the levee. Partial text courtesy of DANFS & Special Collections, Murphy Library, University of Wisconsin-La Crosse. Image courtesy of Special Collections, Murphy Library, University of Wisconsin-La Crosse via Wisconsin Maritime Museum home of the Cobia (SS-245). 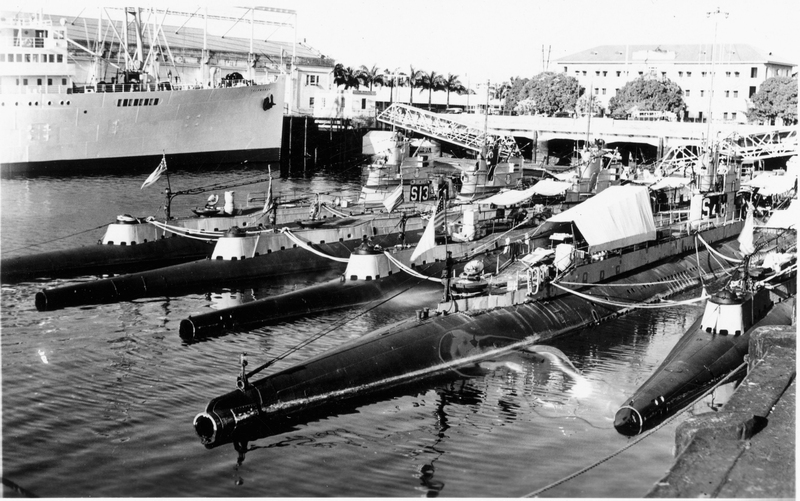 151k S-13 (SS-118), S-10 (SS-115) and S-12 (SS-117) moored at Balboa Docks, Panama. Note the Grace Lines liner (one of four sisters built in 1933: Santa Elena, Santa Paula, Santa Rosa or Santa Lucia) being assisted to dock by a Canal Zone tug (probably Tavernilla). Circa 1933-1935. USN photo courtesy of Dave Wright. 765k Meet the STERN family: S-12 (SS-117), S-11 (SS-116), S-13 (SS-118), S-10 (SS-115) and S-48 (SS-159) pose for a back of the front shot, sometime circa before 20 March 1935, when the S-48 left. The location is most likely Coco Solo, Panama. One other clue as to the date of the photo is the fact that all the boats are still painted haze gray. 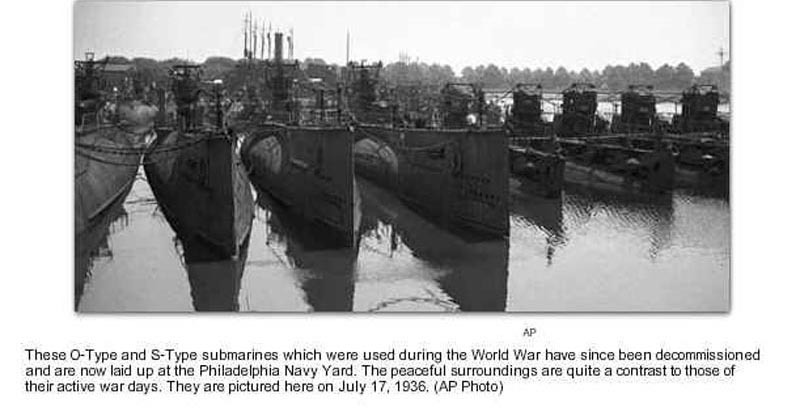 There was a date in the mid 30's when the Navy shifted over to basic black for all the boats. I am thinking that this photo was taken just before that date. The boats on the left have all been modified with the safety updates, i.e marker buoys and hatches capable of taking a McCann Rescue Chamber, but they are still all gray. Photo courtesy of Kevin Welch. 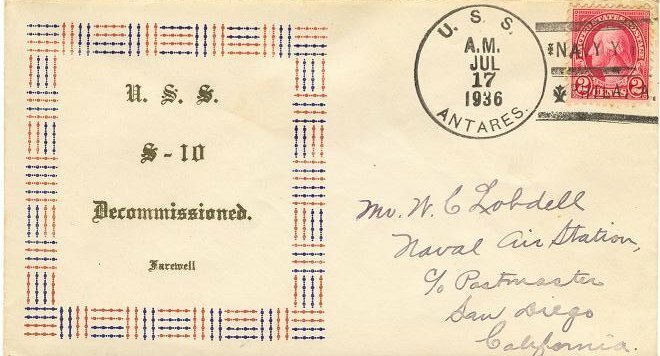 61k Commemorative post mark on the occasion of the S-10's (SS-115) decommissioning, 17 July 1936. Courtesy of Jack Treutle (of blessed memory). 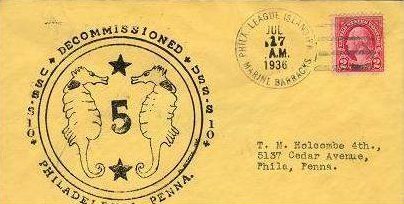 19k Commemorative post mark on the occasion of the S-10's (SS-115) decommissioning, 17 July 1936. Courtesy of Jack Treutle (of blessed memory). The S boats: S-6 (SS-111), S-7 (SS-112), S-8 (SS-113), S-9 (SS-114), S-11 (SS-116), S-12 (SS-117), S-13 (SS-118), S-14 (SS-119), S-15 (SS-120), S-16 (SS-121), S-17 (SS-122) & S-48 (SS-159). Photo & text courtesy of A.P. Wire courtesy of philly.com.